Holidays are activities that must be carried out by every human being at least twice a year. Holidays are very good for reducing stress due to busy life and daily routine. In every corner of the world it must have a unique vacation spot for those interested. Like mountains, beaches, zoos, libraries, malls, or historic museums. And for those of you who are confused about spending your vacation, then we advise you to visit the Curonian Spit in Kaliningrad Oblast, Russia. You will definitely not regret if you go on vacation to this place. Because this place is a favorite destination for foreign tourists and domestic tourists. The Curonian Spit is one of the UNESCO world heritage which is very famous for the beauty and history of human civilization that is there. The Curonian Spit is the second longest spit in the world with a stretch of beach, beautiful spit, high hills, and also a very attractive green forest to explore. This combination of tourist attractions attracts local and foreign tourists. The Curonian Spit is also a tourist place owned by two countries. They are Russia in the Kaliningrad Oblast and the Lithuanian state. The Curonian Spit is a 98 km long, thin and curved spit that separates the Kuranian from the southern Baltic Sea coast located in Kaliningrad Oblast, Russia and the north-west part of Lithuania. Russia has 46 km of this area and Lithuania has 52 km. And most tourists visiting this place are tourists from Russia, Latvia, Lithuania and Germany. Nearly one million tourists come to the Curonian Spit every year. Because to reach this place is very easy. The tourists only use the bus from Kaliningrad. What can be done on the Curonian Spit? Here are the 7 things worth to do in Curonian Spit, Russia that we have presented to you. 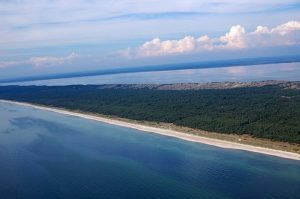 The Curonian Spit has dunes that have a height of up to 35 meters. Some even reach 60 meters. You can climb this hill to a fairly high peak, so you can enjoy the panoramic view of the truly amazing Curonian Spit. After reaching the top you can sit while enjoying the wind that blows your mouth and see the sun on a clear and beautiful beach. The Curonian Spit is the most beautiful place in the Baltic. To explore the beauty of this place, the second activity you can do is sail along the Baltic Sea, Curonian Spit. You can rent a yacht in Nilda, then adventure with excursions and tour guides. By doing this activity, you can immediately see the beauty of the Baltic Sea, Curonian Spit, high hills, and enchanting green forests. Really, you will see an extraordinary sight that you will never forget! Swimming is an activity that is enjoyed by all ages. Besides sailing, you can also swim with your friends. The beauty and clarity of the Baltic Sea water is perfect for refreshing your mind. After swimming, you can enjoy the sand in the Curonian Spit while joking with your friends. For those of you who love the world of photography, the Curonian Spit will be an object that is very suitable for you. Especially, for those of you who like the type of nature photography. Walking barefoot, enjoying the gentle Curonian Spit sand, the wind blowing calmly blowing your hair, and the warm afternoon sun, will certainly be a moment that you will not miss. There are many objects in the Curonian Spit area that you can use. Green forest with its rich flora and fauna, high hills, beautiful beaches, tourists on vacation, or dusk sunsets in the western horizon. You can also explore the forest in this area while occasionally photographing migratory birds, squirrels, and deer. There are so many beautiful photography objects that you can use in this region. Not only children who like to play sand on the beach, adults also like it. Besides being able to write writing messages on the sand, you can also spend time making sand castles with soft Curonian Spit sand. Or you can also look for waves carrying shells or unique stones that are usually hidden in the sand. This is a very exciting activity. Especially if you do it with someone you care about. Like joking with friends, family, or your spouse. After doing lots of fun activities in the Curonian Spit area, then you can close your day by enjoying the sunset while sitting or lying in the sand. Enjoying the twilight with the cool breeze that will surely make your holiday so memorable. Enjoy the sunset and the ocean waves slowly soak your feet, truly defining a great holiday. You can enjoy this sunset with your friends or your spouse. if you enjoy sunset with your spouse, it will definitely be the most romantic moment during your love trip. The last activity worth to do in Curonian Spit is sunbathing. Sunbathing on the soft sand of the Curonian Spit will surely soothe anyone’s mind. Enjoying the sun that warms the body, enjoys the sea breeze, and the chill of the soft waves of the beach will make you feel at home for a long time in this place. The comfort of sunbathing on the Curonian Spit you have never felt before. But remember, you can only do sunbathing in the summer. That’s all 7 things worth to do in Curonian Spit, Russia that you can do when visiting this place. Visiting this place will be one of the unforgettable moments of your life. you will feel relieved and relaxed after releasing all your stress in this place. And you will be more amazed to see the natural beauty of Russia.